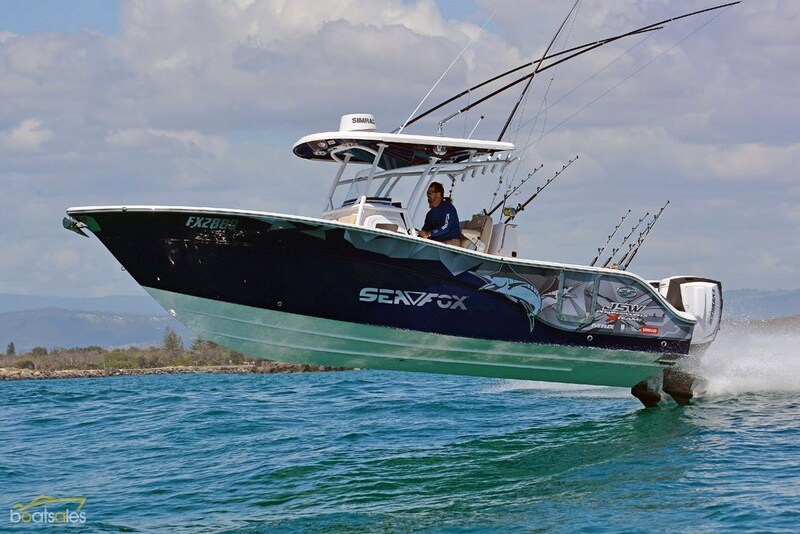 The new Sea Fox 288 Commander combines serious offshore fishing capabilities with the great handling, manoeuvrability and blistering 50-knot speeds normally reserved for dedicated high-performance sportsboats. As such, this stunning new centre console craft is sure to be a hit on the wide fishing grounds this summer. Centre console sporters don’t get much better than the latest release from US manufacturer Sea Fox. The company’s new wide-beam (but still trailerable) 288 Commander is a pretty special bit of gear, offering customers a great value, but exceptionally well-outfitted high-performance powerboat. Cleverly, this impressive new craft is designed as a serious offshore fishing boat but with a versatile interior layout that lends itself equally to bay and harbour sportsboat applications. The new 288 is based on the previous 286 Commander, but with a number of improvements to the interior layout, most notably in the design of the helm console and helm seating/work station, and the re-profiled bow seating and storage areas. 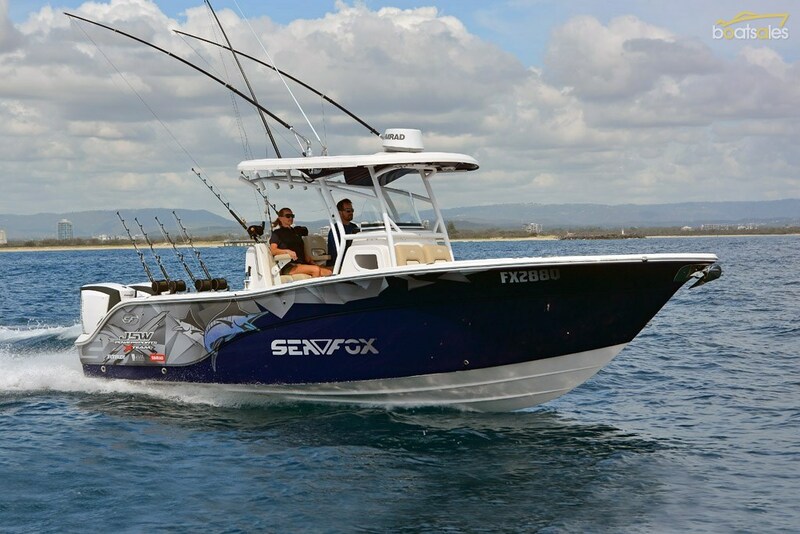 The 288 Commander is the second largest model in the fourteen strong Sea Fox boat range, topped only by the non-trailerable, but equally imposing 328 Commander flagship. 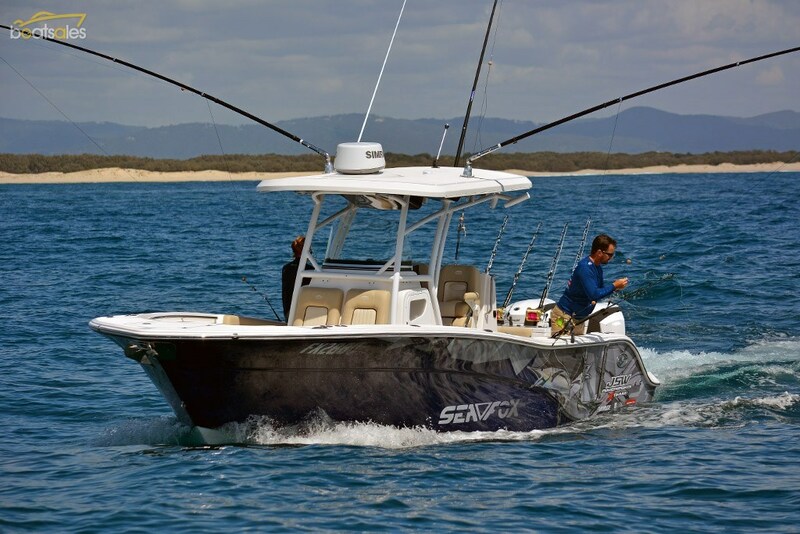 Most of the boats in the Sea Fox range are centre consoles, designed either for offshore or bay fishing applications. 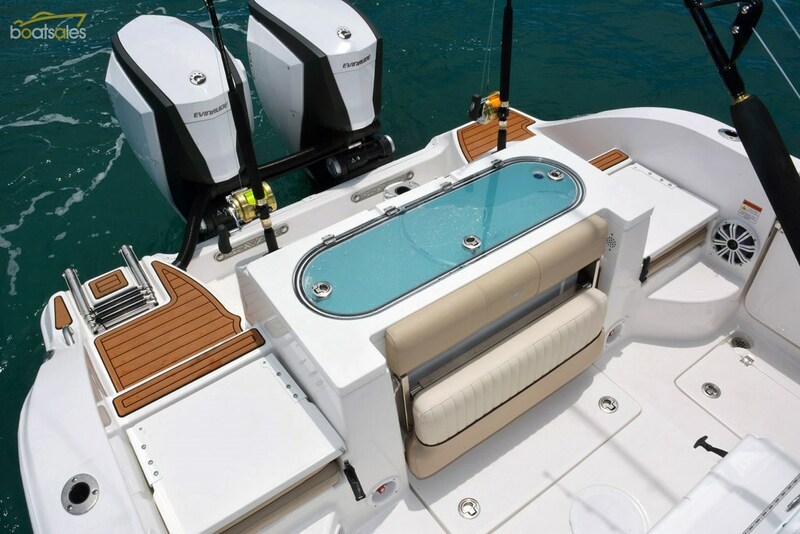 The company has considerable expertise in the production of centre console craft, which is evident in the innovative layout and superb performance of the 288 Commander. Sea Fox boats are generally pretty good value and this is true of the 288 Commander. It has a starting price of around $234k at JSW Powersports on the Gold Coast, complete with a pair of 250hp outboards — and more gear and equipment than you are likely to get from rival brands. Some of this extra gear includes cushions for the forward seating, coaming bolster padding, electric toilet with holding tank, port side dive door, built-in bait/rigging station with slide-out cooler/ice box behind the helm chairs and dual automatic 1100gph bilge pumps. There is a whole heap more standard gear, of course, but you are best to check the Sea Fox website for the full and long inventory. The above pricing does not include a trailer as many owners will keep a rig like this dry stacked or berthed at a marina. If you want a trailer, budget on $12,300 for a Magic Tilt brand tandem-axle aluminium trailer built to Australian specifications with electric/hydraulic break-away brakes. The test boat is priced substantially higher than the base model as it was equipped with a high-end Simrad electronics package, a range of factory fitted options, and a pair of more powerful Evinrude ETEC G2 300hp ultra-longshaft (30in) DFI two-stroke outboard engines. The additions lift the package price to $298,653 plus the extra cost of the trailer if required. The electronics package included dual (yes, two of them) Simrad NSS16 EVO2 multi-function displays, OP50 wired remote controller, 4G broadband radar kit, Simrad AC12 Autopilot with WR10 wireless autopilot remote and base station, Simrad RS35 VHF marine radio with HS35 VHF wireless handset with DSC, GS-25 GPS Antenna, and a Simrad Airmar TM275LH-W transom mount transducer. Factory fitted options included coloured hull sides (Blue Marlin), matching blue paint to the undersides of the Ultima hardtop, bow table, bow infill board with cushion, LED lighting package, overboard waste discharge, white powder coating on Ultima hardtop and leaning post pod, Fusion stereo head unit with 8in kicker speakers, and Taco GS-380 outriggers with 15ft poles (including centre shotgun outrigger). Everything else you can see on the boat is standard, which is quite remarkable when you consider that some of that gear includes the massive 228L pressurised, (and oval-shaped) live well with perforated perspex divider and 1100gph pump, dual underfloor kill tanks, fresh and raw water deck wash, recessed trim tabs, electric anchor winch, adaptive bow seating, fold-out rear quarter seats and a state of the art composite hull and deck construction with foam filled stringers and built-in foam flotation to Australia’s Level Flotation standard. The Sea Fox 288 Commander is a boat of two different halves. The stern of the Commander, aft of the helm console, is all about serious fishing, with rod holders, racks, kill tanks, live wells and heaps of other fishing orientated gear and equipment. 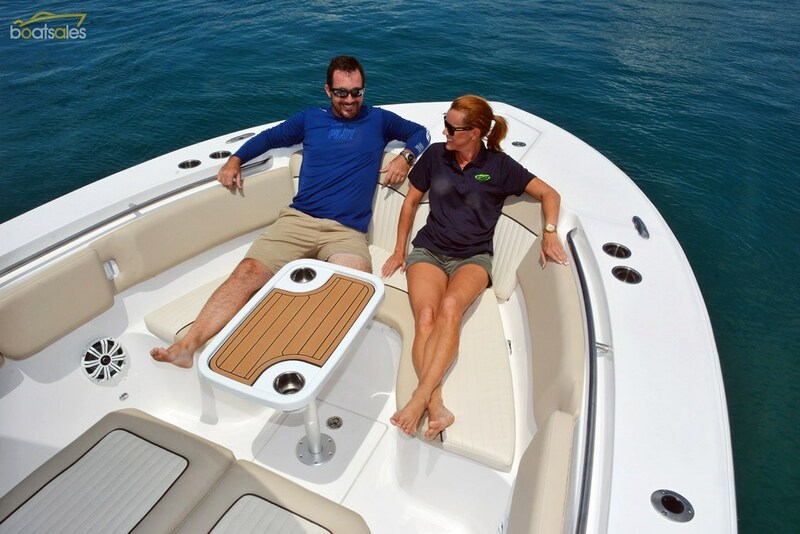 Conversely, the bow of the boat is ideally set up for families with moulded U-shaped bench seating with comfy cushions, padded bolsters, ample storage and special pull-out back rests to create two individual forward-facing lounges. Fitting all of the various seating cushions and infill boards in place creates an additional 2.5m-plus-sized sun lounge stretching down the centre of the bow area — with individual side seating for at least half a dozen other people. With the cushions removed, you can use the moulded fibreglass seating as a casting platform with the optional infill board in place, but this area is primarily designed as a very large seating/relaxation area. Recessed, low-set stainless steel hand rails surround the bow for passenger security and there is a smattering of half a dozen or so cup holders for your cold drinks. The anchor well at the bow is large and rigged for the included Muir electric anchor winch. There are no side pockets or shelves forward, but there is storage for safety gear beneath the two forward side seats, a sub-floor storage bin with included bucket, while options such as the removable pedestal table (which slots in between the front bench seats) can be stowed under the roughly metre square storage box ahead of the helm console. Special provision has been provided in this 284-litre capacity locker for stowing scuba diving air tanks. Behind this locker and beneath the helm console itself is a toilet compartment with full standing headroom. A bi-fold door on the port side of the console opens to reveal steps leading down into this deep recess. 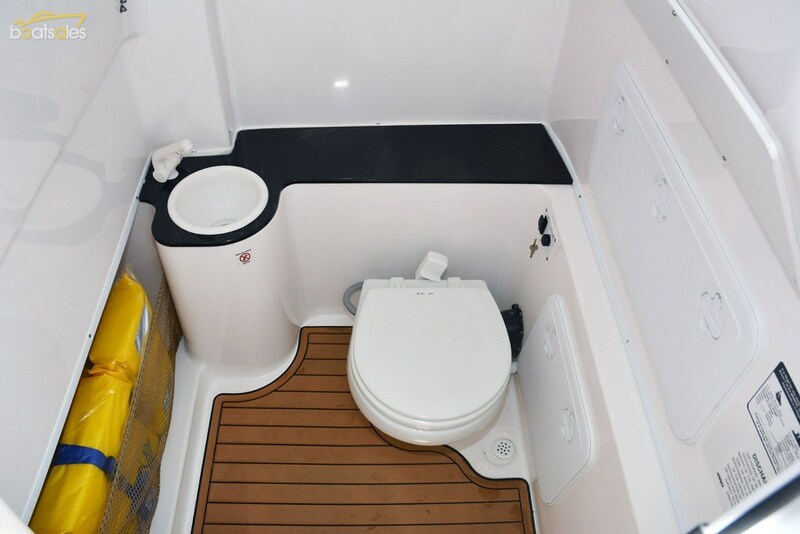 Within you’ll find an electric head, wash basin with freshwater faucet, extra storage shelves - along with easy access to the electrical wiring behind removable hatches. 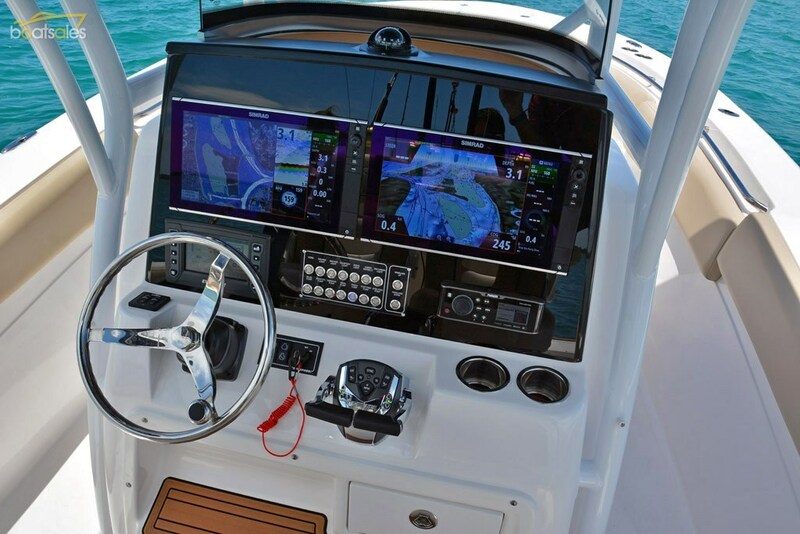 The 288 Commander has an upgraded, modern looking helm console with an instrument panel and fascia designed to accept large flush-fitted electronics displays, as evidenced by the two massive Simrad NSS16 EVO2 models installed in the test boat. Even with those massive high-end displays fitted, there is space for the required switch panels underneath, along with the Fusion stereo head unit and the Evinrude Icon Touch 7.0in CTS digital engine display. As the sturdily built aluminum-framed hardtop is standard with the 288 Commander, the Simrad VHF radio is set into a bulkhead under the hardtop, alongside switching for deck lighting — and within easy reach of the skipper and co-pilot. Also within a comfortable reach, whether seated or standing at the helm, is the tilt adjustable steering wheel (with easy turn knob), binnacle mounted throttle controls and switching for the included trim tabs. The dual bucket chairs have retractable armrests for comfort along with front bolsters which fold up to increase the standing room space between the chairs and the steering wheel. From the helm the skipper has excellent visibility through the curved windscreen which is perched above the console, forward of the included compass. Other features include a lockable glove box, a pair of drink holders, and dual level skipper and co-pilot foot rests. The two deluxe helm chairs are fixed above a large multi-function storage box. As noted earlier, this cleverly designed unit incorporates a bait/tackle rigging station complete with flat rigging surface, shelving storage and slide-out plastic tackle trays. It’s a key fishing feature of the Commander and differentiates it from a number of rival models. Our only reservation with the rigging station is that we would be reluctant to chop up baits on the fold-out rigging table as it would need to be constantly cleaned. In light of this we would advocate buying a separate, light weight bait board that could be slotted into a rod holder (or similarly secured) so that it could be moved to different positions around the cockpit and transom. Beneath the rigging station is a 60-litre capacity Yeti brand ice box/cooler for stowing drinks or baits, depending on the purpose of your trip. The cooler sits on an electrically operated slide-out platform – or you can pull it out manually. Other features of the multi-function helm seat pod/box includes additional tackle trays, deck wash, 12 volt power socket, surrounding stainless steel grab rail, two cup holders and four aft facing rod holders. The stand-out feature of the stern of the 288 Commander is the magnificent live bait/fish well. It is superbly designed with oval shaped sides to limit damage to the baits and pressurized to help prevent the water (and the baits) in the tank from sloshing about when the boat is underway between fishing spots. This superb live well has a capacity of 228 litres and is fed by a 1100gph pump to ensure excellent water flow. With its rectangular shape, the live well may not be wide enough to keep small tuna baits alive, but it will certainly accommodate dozens of big yellowtail and slimy-mackerel-size baits. 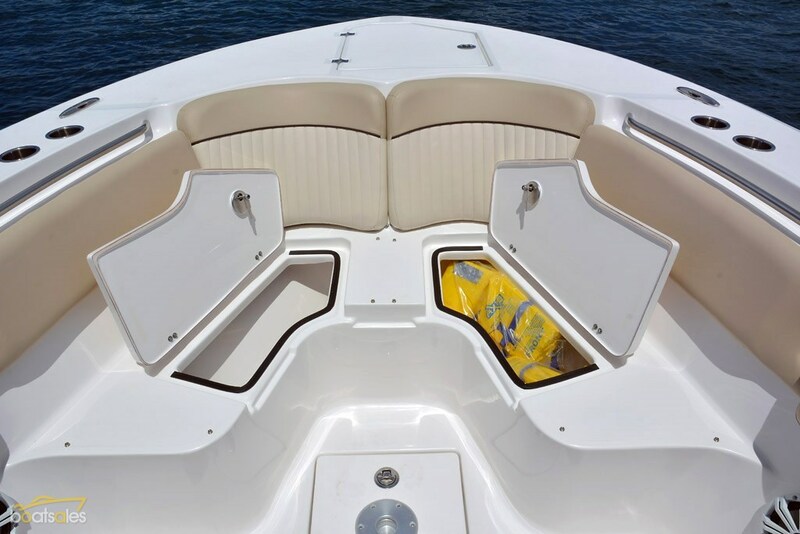 Alongside the live bait tank are transom corner quarter seats with flip-up back rests and padded vinyl cushions. Between them, below the live well is an additional retractable padded bench seat, thus enabling three or four people to sit across the stern of the boat. 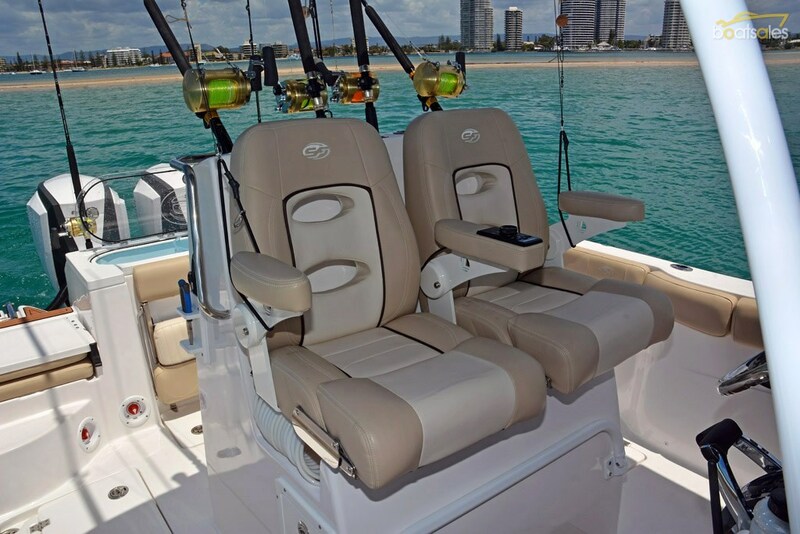 The bench seat is also ideally positioned abaft the rigging station so you can sit and rig baits/lures in comfort. There is storage space beneath the rear quarter seats and when folded down you can step on the fibreglass back-rests to walk through to the rear boarding platforms and ladder. Dual batteries are closeted underneath the starboard side quarter seat with general storage opposite. A hatch in the floor beneath the bench seat provides access to the bilge for servicing. As noted earlier, the cockpit floor is self-bailing with drains in the transom corners. There is ample freeboard to the cockpit sides with around 730mm between the cockpit sole and coaming top. This height drops to just 430mm in the transom corners, above the step-on quarter seats. Other features include wide side coamings for easy rod holder installation (eight are standard), dual, big mackerel sized underfloor kill tanks, pop-up stern cleats, under-gunnel horizontal rod rack storage, and a lift-out dive door. 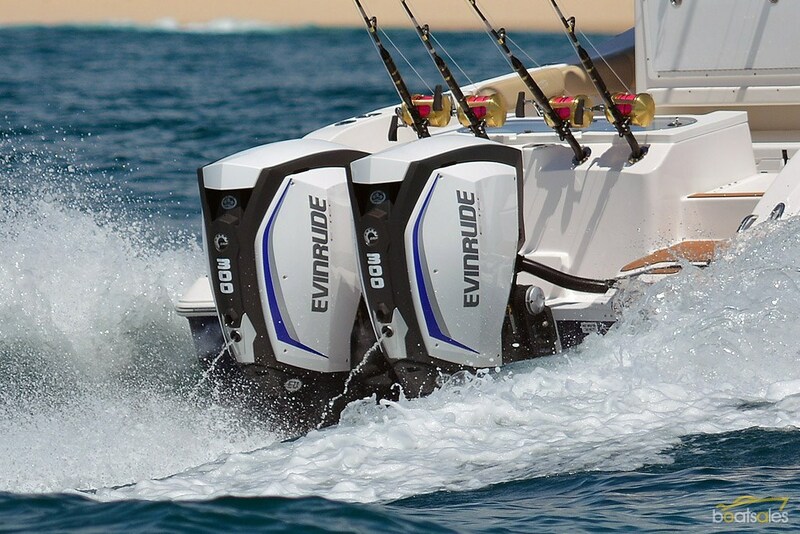 With dual 300hp Evinrude ETEC outboards on the transom, the 288 Commander was understandably fast, cracking 51 knots at a wide open throttle of 5500rpm. Remarkably however, it did not feel over-powered. During the speed tests we touched 40 knots at just 4000 rpm and I remember being surprised at that pace, as the boat was so solid, sure-footed and well balanced that it just did not feel that quick. The stopwatch — or in this case the GPS — did not lie, however, as the boat really is that fast. And we recorded all performance figures with close to full fuel and water tanks. With half tanks the Commander would be even quicker. Do you need 600hp? Perhaps not, but having that much power makes the big 288 Commander a thrill to drive and in calm offshore conditions you can certainly use three quarters of that pace, albeit at the expense of fuel economy. 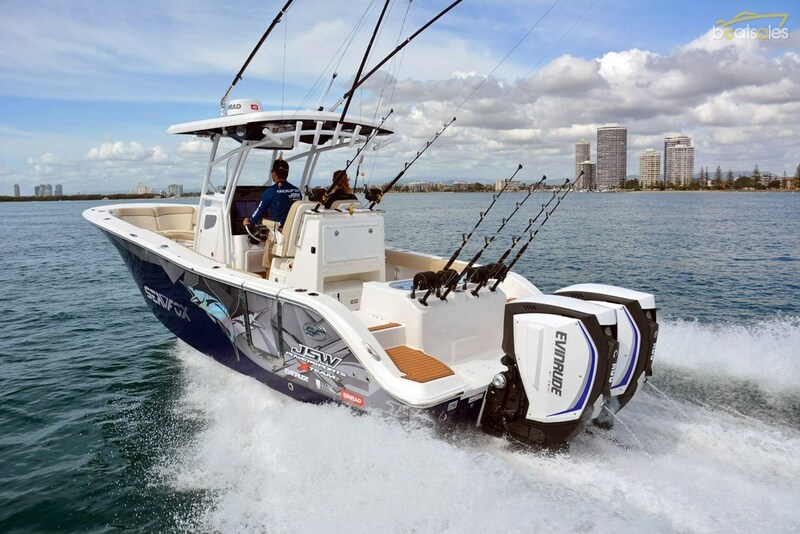 With two big engines on the transom you will want to run the boat at the most economical speed during long runs out to the wide offshore fishing grounds. This maximum fuel economy figure is achieved with the Evinrudes ticking along at 3000 rpm for a boat speed of 26.8 knots and a combined fuel burn of 53lph. This combination yields a maximum range on 95 pr cent of the 745lt fuel capacity of 357.88 nautical miles or 0.506nm per litre of fuel consumed. With regard to handling and ride, there is nothing quite like a big deep vee hull with plenty of power on the transom. The Sea Fox slices through swell and wind chop effortlessly, with the pronounced flare in the topsides pushing most of the spray well away from the boat, even in a quartering headsea. The ride in the 288 Commander is soft, exceptionally stable and well balanced. The Evinrude power steering was sublime and the hull super responsive to changes to trim angle, boat speed and helm movement. 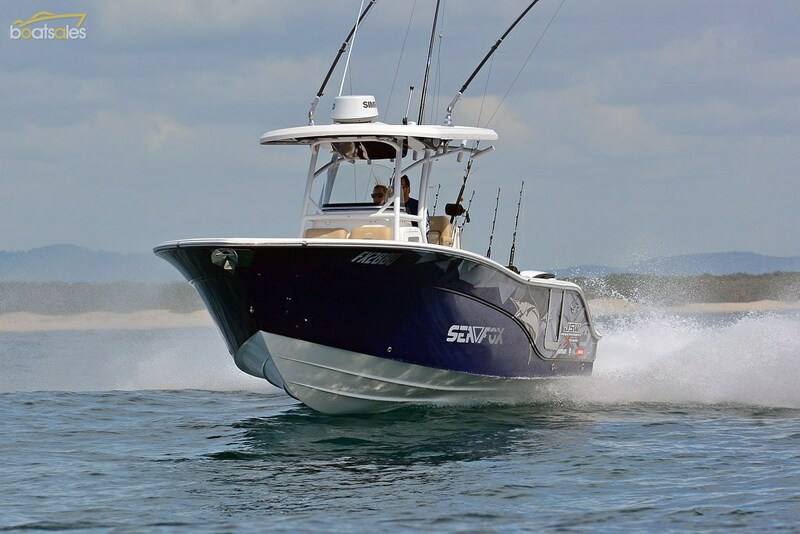 With 600hp on the transom the Sea Fox 288 Commander is a very fast, exhilarating drive. It’s a real buzz opening the throttles on this big rig and feeling the hull burst forward with startling speed and acceleration. As a family fun boat it has plenty going for it, including high performance, stacks of comfy seating and plenty of storage space. Of course, the Commander is much more than a sports powerboat and bay cruiser. 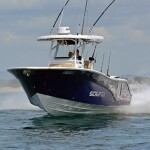 It is a top-shelf offshore sportfishing machine, enhanced by the excellent interior design and layout along with some key standard inclusions, most notably the huge live well, excellent tackle rigging station, modern designed helm console and hardtop, wide side coamings and deep cockpit. It's hard to imagine a place, a canyon, kink, sea mountain, distant island, fishery and a far-flung hot spot where the 288 Commander couldn't reach at speed, in comfort, and then take control. Price as tested: $298,653 including twin Evinrude ETEC G2 300hp extra-long shaft (25in) DFI two-stroke outboards with tilt power steering, coloured hull sides, paint to undersides of hardtop, bow table, bow infill board with cushion, LED lighting package, overboard waste discharge, white powder coating on Ultima hardtop and leaning post pod, Fusion stereo head unit with 8in kicker speakers, Taco GS-380 outriggers with 15ft poles, Simrad electronics package including dual NSS16 EVO2 multi-function displays, OP50 wired remote controller, 4G Broadband radar kit, AC12 Autopilot, WR10 wireless autopilot remote and base station, RS35 VHF marine radio, HS35 VHF wireless handset with DSC, GPS Antenna GS-25, Airmar TM275LH-W transom mount transducer, and 12 months boat registration. Priced from: $233,600 including twin Evinrude ETEC G2 250hp extra-long shaft (25in) DFI two-stroke outboards with power steering and 12 months boat registration. Trailer option: Add $12,300 for an Australian specification Magic Tilt brand tandem axle drive-on aluminium trailer with electric/hydraulic break-away brakes. To read the review on boatsales.com.au click here.